Harrison Gray Otis was a lawyer and politician, and one of the most prominent residents of Boston at the turn of the 19th century. Born in 1765 as a member of the prominent Otis family, he was a young boy when his uncle James became one of the leading anti-British patriots in the years leading up to the American Revolution. After graduating from Harvard in 1783, Harrison subsequently opened his law practice in Boston, and in 1796 he was appointed as the U.S. Attorney for Massachusetts. That same year, he was elected to Congress, and served two terms from 1797 to 1801. Otis would go on to serve in the state legislature from 1802 to 1817, and was elected to a term in the U.S. Senate from 1817 to 1822. A few years later, he finished his political career by serving as mayor of Boston from 1829 to 1832. 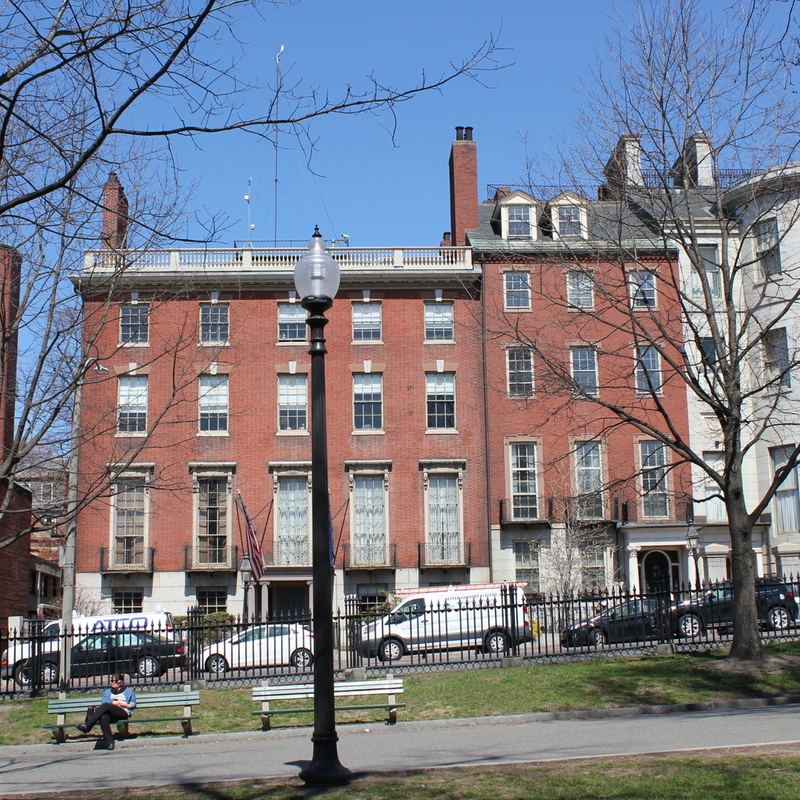 However, despite his extensive political career, his greatest legacy in Boston has probably been his three houses on Beacon Hill, all of which are still standing today as some of the finest examples of residential Federal architecture in the country. All three of his houses were designed by Charles Bulfinch, one of the nation’s most prominent architects of the late 18th and early 19th centuries. The first house, completed in 1796, was built on Cambridge Street, but Otis only lived here for a few years before moving in 1800, to another new house on Mount Vernon Street, near the top of Beacon Hill. He did not live there for very long either, though, because his third house, seen here on Beacon Street, was completed in 1808. 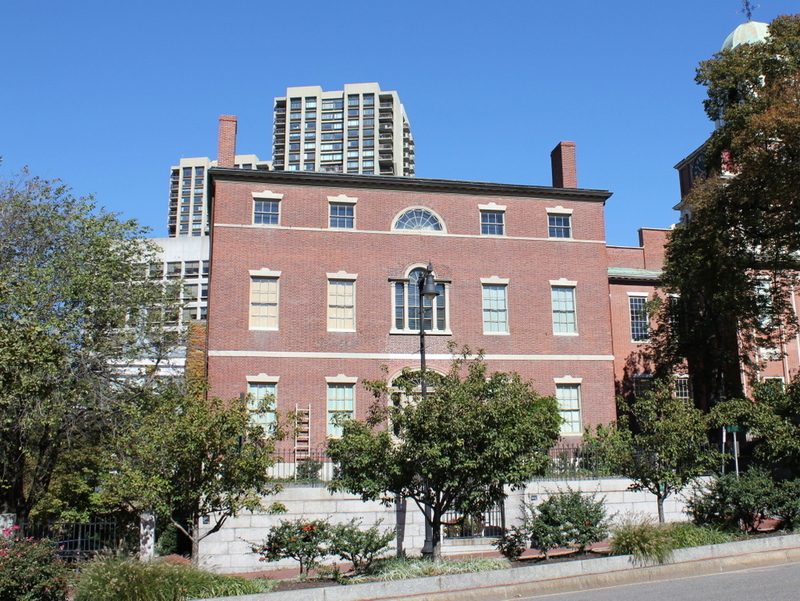 When the house was completed, Beacon Hill was just starting to be developed as an upscale neighborhood for Boston’s elite, and Otis’s house occupied one of the most desirable spots, directly across from Boston Common. Although most of the houses here are townhouses, his was originally built as a freestanding home, with gardens to the right and behind it, and a driveway to the left. The house itself is considered to have been one of Charles Bulfinch’s finest works, and Otis was evidently satisfied with it, because he lived here until his death 40 years later in 1848. Otis’s political career peaked during the time that he lived here, and this house saw several distinguished guests, including James Monroe, who stayed here during a visit to Boston in 1817, as well as Senator Henry Clay. With Beacon Hill becoming the city’s most desirable and exclusive neighborhood, though, property values rose to the point where Otis could no longer justifying having large gardens around his house. So, in 1831 he sold a 25-foot wide section of his garden to his neighbor, David Sears, who built an addition to his own house. This granite townhouse, which can be partially seen on the far right, was built for his daughter Anna and her husband William Amory, who was a prominent textile manufacturer. Two years later, Otis filled in the gap between the two houses by building 44 Beacon Street, directly adjacent to his own house, for his daughter Sophia and her husband, Andrew Ritchie. By the time Harrison Gray Otis died in 1848, his formerly freestanding home had been mostly incorporated into the streetscape of Beacon Street. The only remnant of the gardens that once surrounded his home is the driveway on the left, which leads to a carriage house in the backyard. A rarity in Beacon Hill, this driveway is the only break in an otherwise continuous row of houses on Beacon Street between Walnut and Spruce Streets. When the first photo was taken about 12 years after his death, the house and its surroundings had already assumed its present-day appearance, and there is hardly any difference despite being taken over 150 years apart. When the first photo was taken, the house was owned by brothers Samuel and Edward Austin, both of whom were merchants. Neither brother ever married, and after Samuel’s death, Edward continued to live here for many years, until his own death in 1898 at the age of 95. The property changed hands several more times in the first half of the 20th century, and by 1940 it was owned by the Boy Scouts, who used it as offices until 1954. Since 1958, it has been owned by the American Meteorological Society, and it is used as the organization’s headquarters. During this time, the interior was significantly renovated, but the exterior of the house has remained well-preserved, and it still stands as one of the finest homes in the Beacon Hill neighborhood. 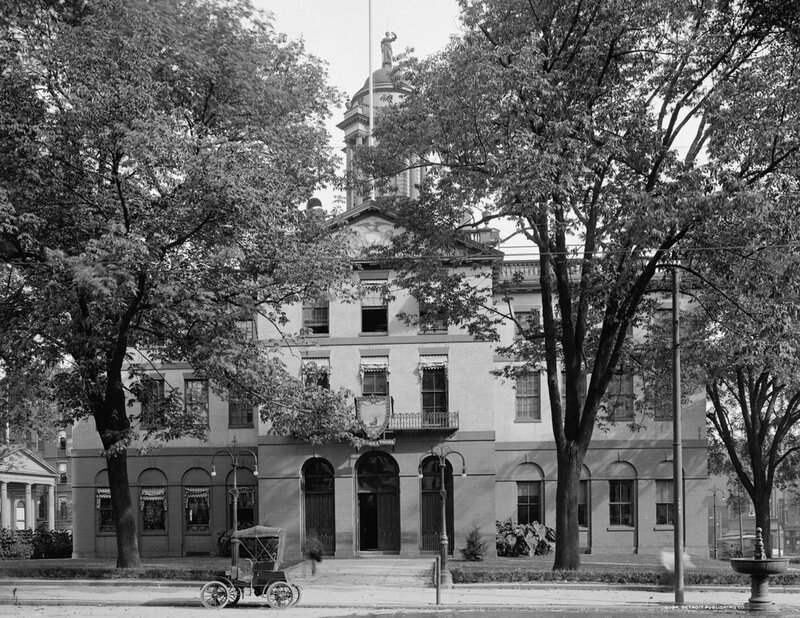 The Old State House in Hartford, seen from the Main Street side around 1907, during its time as Hartford City Hall. Image courtesy of the Library of Congress, Detroit Publishing Company Collection. 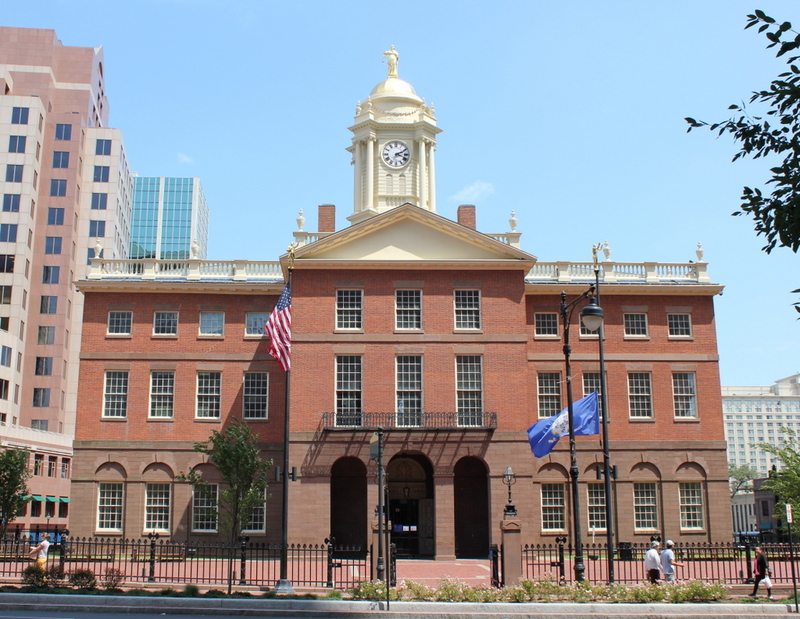 The Old State House in Hartford is one of the oldest existing buildings in the city. It was completed in 1796, and its design is generally credited to prominent architect Charles Bulfinch as one of his early commissions. Just a few years later, he would design the present Massachusetts State House, and he would later play a role in designing the US Capitol. At the time, Connecticut actually had two capital cities, with the legislature meeting alternately between Hartford and New Haven. It may seem somewhat unusual for one of the smallest, most densely-populated states in the country to have two capital cities, each complete with its own capitol building, but the arrangement was not unheard of. Similarly-sized New Jersey had two capitals in colonial times, and, not to be outdone despite its small size, Rhode Island had five capitals in the early 19th century, with the legislature rotating through each of the state’s five county seats. 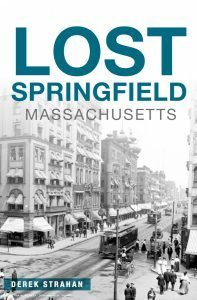 Here in Connecticut, ease of transportation thanks to railroads meant that it was unnecessary to have redundant capitals just 35 miles apart, but the location of the capital city still carried significant symbolic value. In the end, Hartford won out over New Haven. In 1875, it was designated as the sole capital city, and three years later a new, much larger capitol building was completed at Bushnell Park. When its days as a capitol ended, the old building became Hartford City Hall. It served in this role until 1915, when the current Municipal Building was completed. Since then, it has been threatened with demolition several times over the years, but it remains standing as a relic of Connecticut’s history, and it is listed as a National Historic Landmark on the National Register of Historic Places. The First Harrison Gray Otis House, on Cambridge Street in Boston, on October 23, 1911. Image courtesy of the City of Boston Archives. At the end of the 1700s, Cambridge Street was lined with the homes of wealthy Bostonians, including lawyer and politician Harrison Gray Otis. His house was designed by Charles Bulfinch and completed in 1796 while Otis was serving as the U.S. Attorney for Massachusetts. Later that year, he was elected to Congress, where he served two terms in the House of Representatives. The house is an excellent example of Federal architecture, designed by one of the most prominent American architects of the era, but Otis only lived here for less than five years. In 1800, Bulfinch designed a second home for him, on Mount Vernon Street on Beacon Hill, but again he only lived there for a few years before moving into his third and final Bulfinch-designed home in 1806, on Beacon Street across from Boston Common. Likewise, Otis changed jobs almost as frequently as he changed houses. After two terms in the House of Representatives, he served in the Massachusetts state legislature from 1802 to 1817, including as the state Senate President for several of those years. From 1817 to 1822, he served in the U.S. Senate, and then from 1829 to 1832 he finished his political career as the mayor of Boston. All three of his houses are still standing today, but the first one here on Cambridge Street has seen a number of changes, as the two photographs show. During the 19th century it became a boarding house, and a one-story addition was built for storefronts. Other more minor alterations included the removal of the original Palladian window and the lunette window above it, and the addition of dormers on the roof, a storm porch at the front door, and a bay window on the second floor. 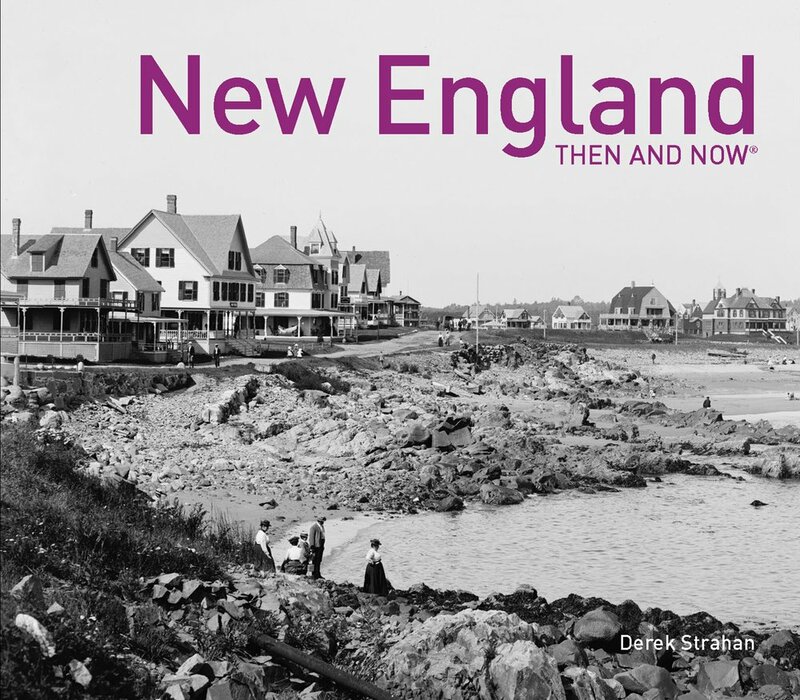 A few years after the first photo was taken, the house was purchased by the Society for the Preservation of New England Antiquities, which is now called Historic New England. They restored it and undid many of the 19th century alterations, and in 1924 the house was moved back 40 feet to its current location to allow for Cambridge Street to be widened. Since then, it has been restored further, and aside from serving as Historic New England’s headquarters, it is also open to the public as one of their many historic house museums. It is next to another historic landmark, the Old West Church, which was built just a few years after the house and can be seen on the right side of both photos. 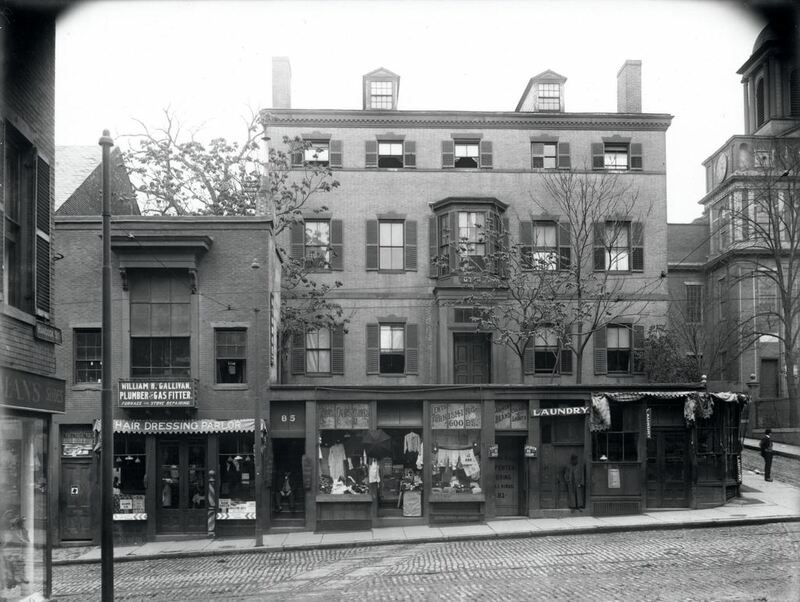 The Parkman House at Bowdoin Square in Boston, in 1880. Image courtesy of the Boston Public Library. The Bowdoin Square area was once a prominent residential neighborhood, and these two attached granite houses were built around 1816 by Samuel Parkman, a wealthy merchant who hired Charles Bulfinch to design them. Samuel Parkman’s daughter Sarah lived in the house to the left, along with her husband, Edward Blake, Jr., who died in 1817, shortly after they moved in. Sarah lived here until her death in 1847. Parkman himself lived in the house to the right until he died in 1824, and another daughter, Elizabeth, lived here with her husband, Robert Gould Shaw, until around 1840. Both the Parkman and Shaw families were prominent in Boston’s 19th century upper class. Samuel Parkman’s grandson was Francis Parkman, a noted author and historian, and Robert Gould Shaw was one of the wealthiest men in the city. When he and his wife left this house in 1840, they moved to the other side of Beacon Hill, to a house overlooking Boston Common at the corner of Beacon and Joy Streets. By 1846, he had an estimated net worth of a million dollars, much of which he had inherited from his father-in-law. Shaw’s grandson and namesake, Colonel Robert Gould Shaw, would go on to achieve fame as the commanding officer of the 54th Massachusetts Infantry Regiment, one of the first all-black units to fight in the Civil War. 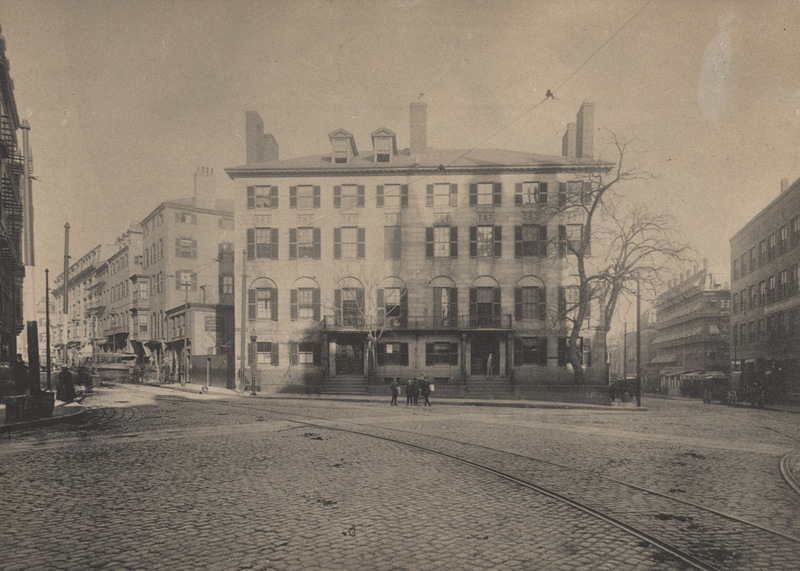 The two houses stood here at Bowdoin Square until the early 1900s, when they were demolished and replaced with a commercial building. This building is no longer standing either, nor is anything else from the 1880 photo. The entire West End section of the city, aside from a few buildings, was demolished in the late 1950s as part of an urban renewal project, similar to what was done at nearby Scollay Square around the same time, Even the road networks were changed, and today Bowdoin Square bears essentially no resemblance to its earlier appearance. 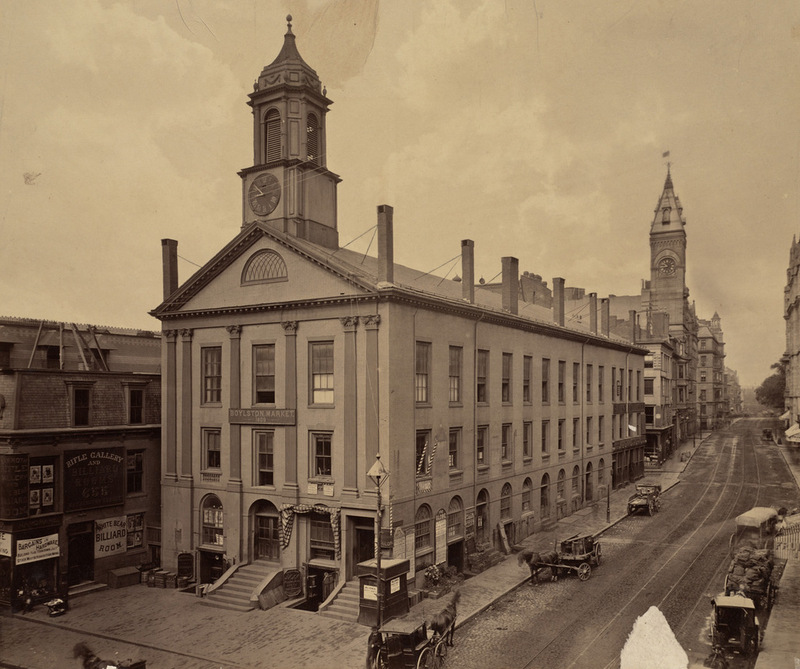 New South Church at the corner of Summer and Bedford Streets in Boston, around 1855-1868. Image courtesy of the Boston Public Library. 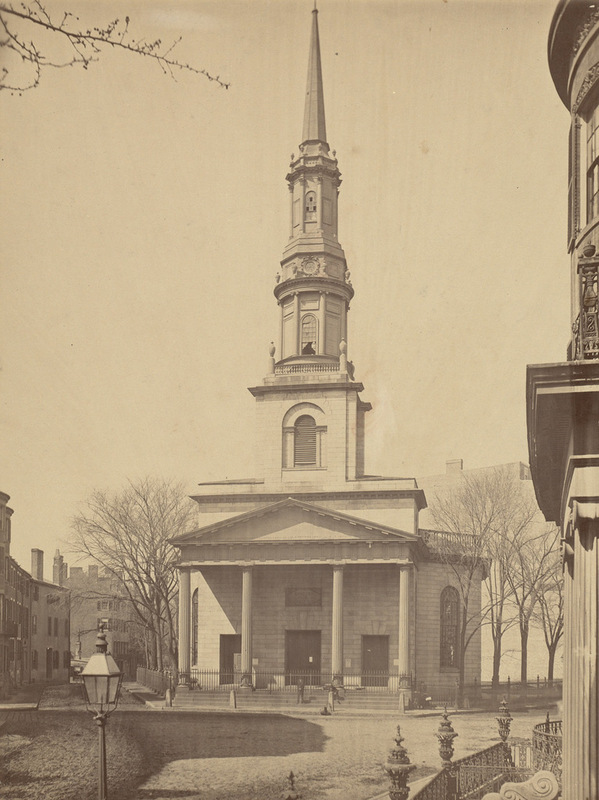 Not to be confused with the Old South Meeting House, or the New Old South Church, this church at the corner of Summer and Bedford Streets was known as the New South Church. It was octagonal in shape and made of granite, and it was designed by Charles Bulfinch, a prominent early American architect who designed a number of buildings in Boston, including the Massachusetts State House, the expanded Faneuil Hall, and Boylston Market. When the church was completed in 1814, this neighborhood in the present-day financial district was an upscale residential area. 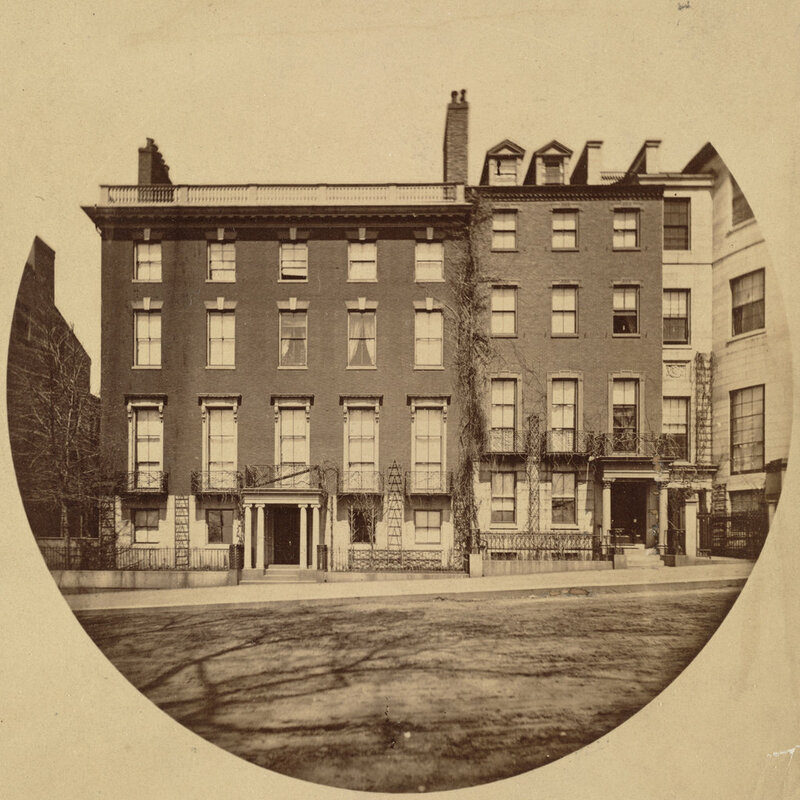 A few block away on Franklin Street was Bulfinch’s famous Tontine Crescent, and here on Summer Street there were also a number of high-end townhouses. Daniel Webster lived in a house at the corner of Summer and High Street, just a few steps back from where these photos were taken, and although he died before the first photo was taken, this would have essentially been the view he would have seen whenever he left his house. 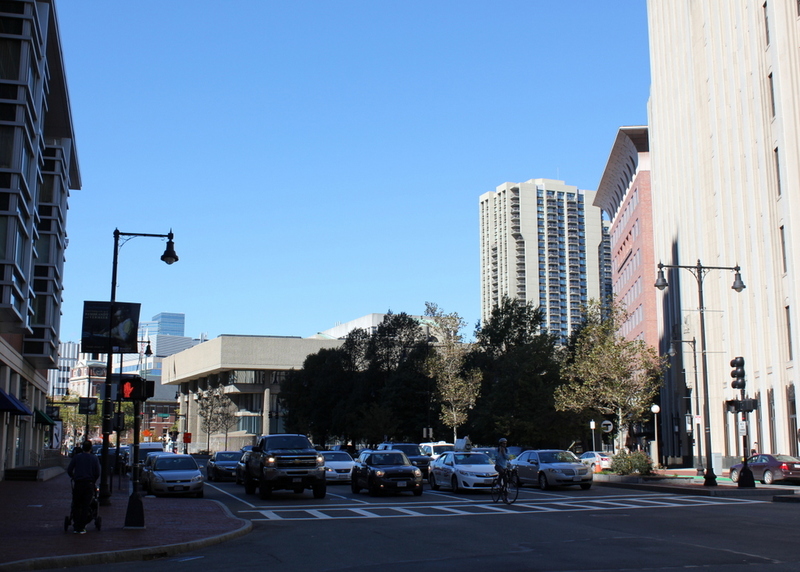 By the 1860s, though, Boston was running out of land, and this area was eyed for redevelopment. Most of the townhouses were taken down as the neighborhood shifted from residential to commercial, and in 1868 the New South Church was also demolished and replaced with a bank. The new building didn’t last long, though; it was destroyed in the Great Boston Fire of 1872, and the present-day Church Green Building was completed the following year. Although the historic church is long gone, its eventual replacement has become historic in its own right. Despite being in the heart of the Financial District, it has survived for nearly 150 years, and it is now listed on the National Register of Historic Places. Boylston Market, at the corner of Boylston and Washington Streets in Boston, around 1870. Image courtesy of the Boston Public Library. 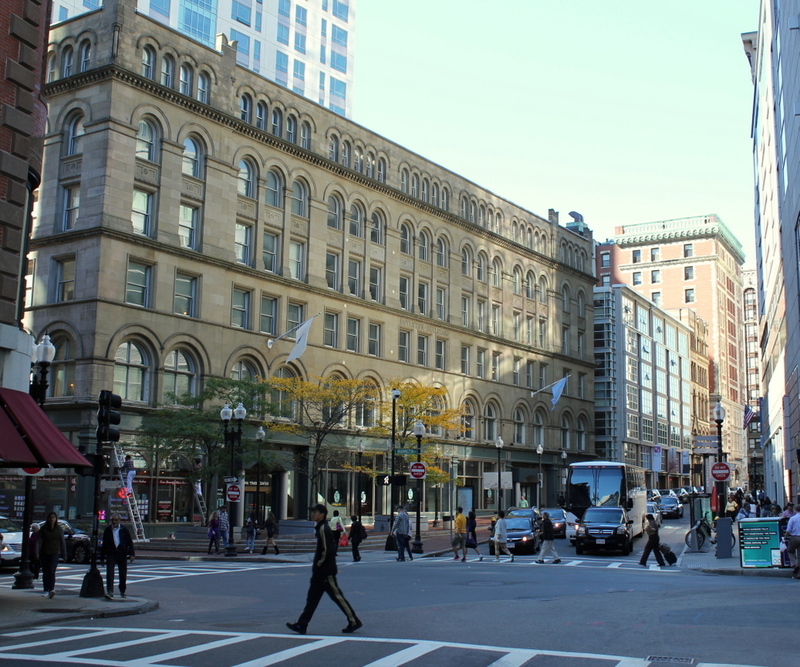 Although moving the large brick building was a significant undertaking, Boylston Market was demolished just 17 years later, in 1887. 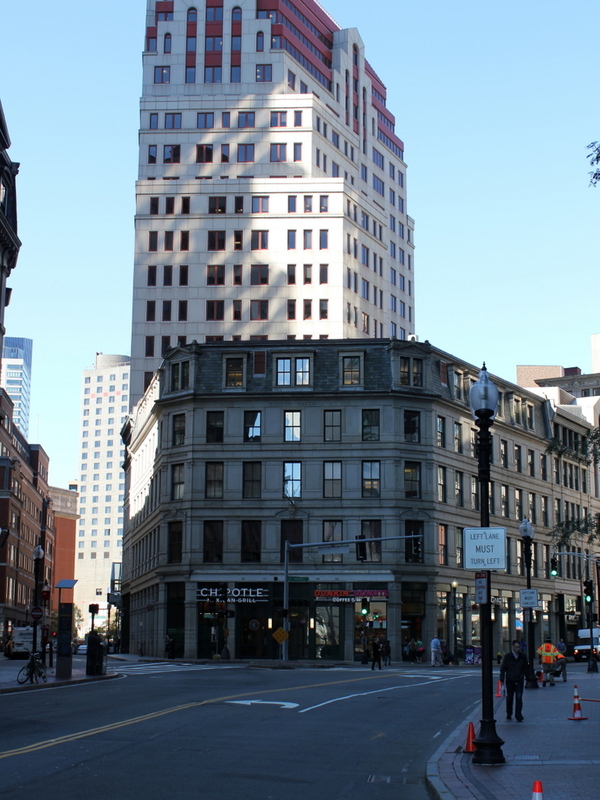 It was replaced by the Boylston Building, which served much the same function as its predecessor, with retail space on the first floor and warehouse and office space on the upper floors. As seen in the 2015 photo, it is still standing today, and it is listed on the National Register of Historic Places. There is at least one surviving element from the original building, though. The cupola was saved, and it now forms the steeple of the Calvary Methodist Church in the nearby town of Arlington.